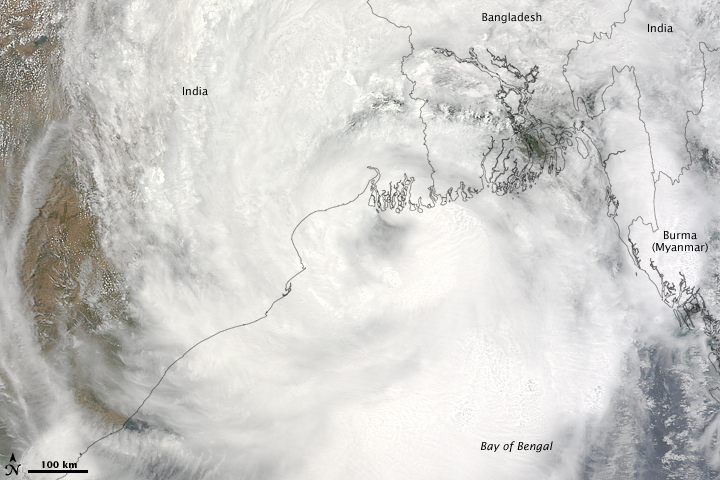 Tropical Storm Aila struck southern Bangladesh and eastern India on May 27, 2009. The New York Times reported that floods and mudslides killed at least 191 people and left hundreds of thousands more homeless. As of May 27, the death toll was expected to rise. The Moderate Resolution Imaging Spectroradiometer (MODIS) on NASA’s Terra satellite captured this true-color image of Aila on May 25, 2009, the same day that the storm temporarily strengthened to a Category 1 cyclone. Aila almost completely fills this scene, stretching from the Bay of Bengal deep into India, Bangladesh, and Burma (Myanmar). On May 25, Aila’s wind speeds ranged from 74 kilometers per hour (46 miles per hour or 40 knots) to 120 kilometers per hour (75 miles per hour or 65 knots). According to the Associated Press, some 2.3 million people were affected by Aila, many of them stranded in flooded villages. Storm surges in Bangladesh flooded agricultural areas with salty water. Home to roughly 25,000 residents, the coastal island Nijhum Dwip was reported to be completely submerged. As of May 27, 2009, many rural villages had not yet been reached by relief workers, and the death toll was expected to rise significantly as search and rescue efforts continued. Aila almost completely fills this true-color image from May 25, 2009. The storm stretches from the Bay of Bengal deep into India, Bangladesh, and Burma (Myanmar). McDonald, M. (2009, May 27). 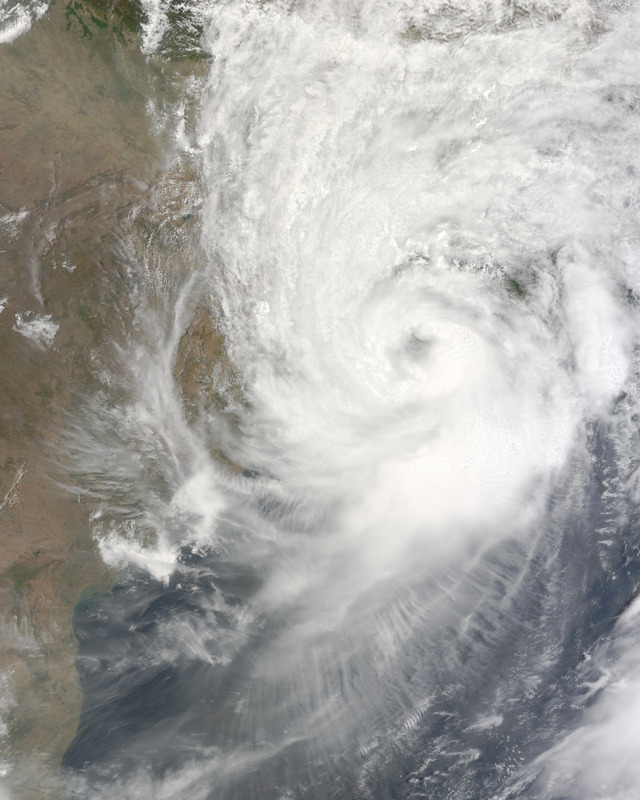 Cyclone Aila kills 191 in south Asia. The New York Times. Accessed May 28, 2009. Unisys Weather. (2009, May 24-25). 2009 hurricane/tropical data for the northern Indian Ocean: Cyclone Aila. Accessed May 28, 2009.